It was one of Toronto's most popular oldies shows and a perfect showcase for the wit and wisdom of Don Daynard. "As far as the oldies show starting at CKFM, I was single at the time and would go to my place in Oliphant, on the Bruce Peninsula every weekend and driving home on Sunday night, across Highway 89 to the 400, I'd pick up a station in Buffalo that had an oldies show ... forget the name of the station, but Craig Smith would likely remember. After a month or two, it came up in a conversation with Craig Smith who said he listened to the show too, and we both suggested that it was the kind of show we'd like to do. Craig has an incredible collection of oldies and that's what we used, rarely going into the station's material. We approached Bill Ballentine and he said to do a one-hour pilot, which we did and they sat on it for two or three weeks and then said "let's do it" and to do a two-hour show every Saturday night from 7:00 'til 9:00. CKFM was getting clobbered by CHFI in that time period with something called "In Concert" where they ran an entire album with applause between each cut so it sounded live. Anyway, we edited the one hour pilot slightly ... I should say Craig edited it as he did all the work, programming, editing, all that .. and did a second hour and debuted the show and within weeks it took off and was huge for the rest of the run, eventually expanded to three hours. All done on tape, reel-to-reel, and Craig edited it and ran from that (there was a guy in Mississauga who had copies of every show we did ... 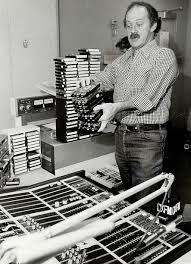 I visited his place once and the entire back wall of his den was reel-to-reel tapes of "Lookin' Back"). Unfortunately, I don't recall his name. Would be interesting to know if he still has them and what shape they are in!) The theme for the show was "Kinda Easy Like" by Booker T and the Whatevers. Always called them Booker T and the Mugwumps!! When I went to CHFI I took the show with me but we couldn't call it "Lookin' Back" as the Slaights had copyrighted the name before we could. I wanted them to hire both Craig Smith and Jeremy Brown but they passed on both of them. Anyway it started lamely with interviews and crap like that - we did do interviews on the original "Lookin' Back" show but I recall them being much more interesting. I mean, we once interviewed some ballet dancer who was an oldies fan! Jesus Murphy! Of course, we also interviewed Wolfman Jack about three days before he went back home and died in his driveway! I hope it wasn't our fault! But then we eventually settled into a pretty good run except for the past year or so when they cut back on the playlist. When I retired from the morning show in December of '99 I continued on doing the oldies show, even though they had cut back the playlist even more. It was terrible. In the fall of '03 I had cancer surgery and although I had agreed to come back, I got out of the contract and haven't had anything much to do about radio ever since..."
Don also tells us that it was Craig Smith who chose the introductory theme by Booker T and the MG's. Kinda Easy Like was on the album Melting Pot, released in December, 1970. Hear Lookin' Back on CKFM from January, 1981 (UNSCOPED) here. Hear Lookin' Back on CKFM from January, 1981 (SCOPED) here.